Leashes, you wonder which one is right, or you have only 1 and it’s not always right, so what’s the best leash? The answer is several! I too have struggled with a variety of leashes. In my former life, I usually drove to a trail head and then hiked off leash. So my dogs lacked good leash manners, due to lack of experience. So before I became a full-time RVer, I started walking a lot in my neighborhood with the dogs on leashes. As an RVer, my dogs now walk daily on leashes and there are different situations that lead to different leashes. I have used all kinds from retractable to bungee style. With the many options to choose from you can have different leashes for a variety of situations. I don’t believe there is one leash for all applications, I think you need several. And if you are like me, I have several in my house (motorhome) and several in my car. This way I’m always prepared. 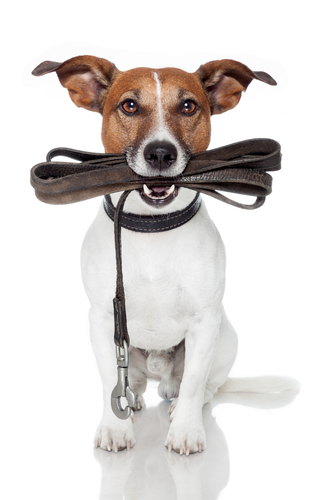 Here are some suggestions for your leash repertoire. 4 foot leash – I think a nice short leash attached to your dogs harness is the most appropriate leash in a busy area like a downtown sidewalk or paved walkway. This lets you keep the dog close to you. 6 foot leash – This is the most common leash, and one that I use most with my dogs. I particularly like ones that 2 Hounds Designs makes that have the ability to hook on 2 places on the harness or hook up to a tie up location. Leash with bungee built in – I’ve used one of these leashes and liked it for Mick. I think it’s a personal preference and depends on your situation with your dog. It would be appropriate in a quiet location, not on a busy city street. Long lines are 10 – 50 feet. They are just one big long leash. I like a 15-20 foot long line, this is usually plenty. This is what I walk Mick on when walking in a quiet area with leash laws, parks, quiet roads and trails. Romeo stays on a 6 foot leash which works for him. 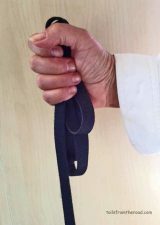 There is a way to hold this leash properly (see below), and I’ll be honest, it takes practice and it takes paying attention all the time. Have a harness on your dog. Do your best to keep alert and focus attention on your dog. Put the loop around your hand, but not around your thumb. 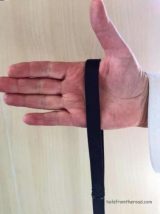 Then loop up the extra line and hold it, do not wrap it around your hand. Let 6-8 feet out or more if you are comfortable. Now you can walk, letting some out, bringing it back in. Practice calling your dog to you, reward!, then say go play. This is the best way to practice recalls. If you dog is apt to run out, be prepared to drop the extra line and hold on using the other hand. If you are going to be hurt, let go. Because if you are seriously injured, you are no help to your dog. Keep an eye out for the trailing line, you can walk into it. In appropriate situations like a big field, you can let your dog drag the line. Some people tie knots in the line so you can step on it and stop it easier. Do not use a long line next to a busy street, in a busy area, busy trail, busy walking path, it’s just too dangerous. If the long line is too much, stick with a shorter leash. Pitfalls of the retractable leash. Let’s talk about the dreaded retractable leash. Most trainers despise these and it’s a hot topic on many dog forums. Why are they so dreaded? Because they are used in inappropriate situations. Have you ever gotten burned by the line? It hurts bad! If the line gets wrapped around you or other dogs, it’s really difficult to deal with. I have a scar on the back of my leg from 20 years ago a cord burned me. Read this article by Consumer Reports for some gory details of retractable leash accidents. A retractable leash is NOT appropriate in these situations. In a busy area like a sidewalk. On a busy walking path. 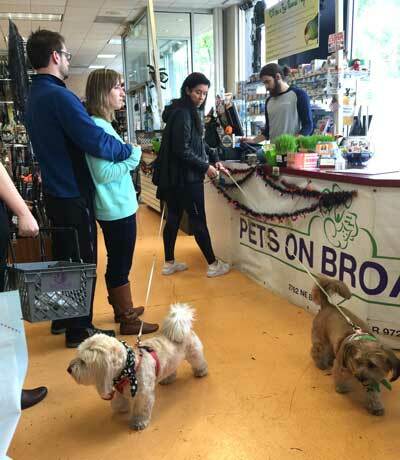 This dog owner has 2 dogs in a very busy pet store on flexi leads. While she was trying to purchase her items, the dogs were all over the place, tripping up others, making it difficult for the owner to check out. Solution: 4-6 foot leash, STAND ON THE LEASH. This gives the Dog Owner the ability to focus on her purchase and the dogs are safe and out of the way. The only place to use retractable leash is on a quiet trail, park or road with your dog in a harness. Recently, I was walking my dogs and across the street was a lady with a dog on a collar and a retractable leash. The dog ran at us and hit the end of the line and spun in the air. Damage to the neck and spine can cause many medical diseases down the road. Also the collar could slip off and now the dog is in the street or approaching an unsafe dog. 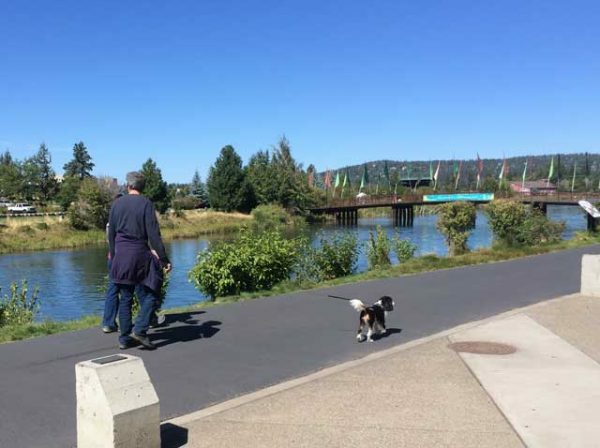 These folks were walking their dog on a retractable leash on this very busy river walk with bikers, kids and many other dogs. Right after this photo, I bike almost got hung with the line. Another big problem is the tension on the retractable leash is always on, meaning, your dog is feeling the pull all the time and therefore, when you put your dog on a regular leash, he is going to pull because he is use to the pressure and he has learned that pulling gets him where he want to go. If you have situations that are appropriate for using a retractable leash, I recommend the Smart Leash. It has a brake built in it which works like a seat belt. If your dog tries to run out, the brake will activate and hold them back at that point in the line. Other nice features are a comfortable rubber grip, reflective tape for the line, bungee material near the clip for shock absorption. It’s a very nice piece of equipment. Please make decisions that will keep you, your dog and others safe out there in the big beautiful world we live in. I have always used a 6 foot leash – really don’t think I am coordinated enough to use a 50 foot lead. I have also used a retractable leash for years; however, the only time I use the retractable feature is when I take it down from its hook, clip it to the leash and then lock it when my pup gets out about 6 feet. LOL, not really much need for the retractable feature. I hear you Lisa. I have used a bunch in the past, even the Smart Leash retractable, but now I just use a 6 footer and try to find places where my dogs can be off leash, like a dog park or a great Oregon Beach! In some situations I use the long line, but yes, it takes some work. Thanks for stopping by!